All compost worms are shipped on MONDAY'S ONLY with FedEx Express 2 day. All orders must be placed by 1:00 P.M. central standard time on Monday for them to ship the same day. FREE shipping on all compost worm orders!! Composting worms, Red worms, Red Wigglers, Sunfish Worms, Fishing Worms, Tiger Worms, Hybrid Reds, Manure Worms or whatever you want to call them - Our wholesale red worms are the most popular type of composting worms. 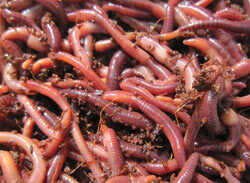 Our wholesale composting worms (red worms) are easy to raise and need very little care. Our Wholesale Composting Worms (red wigglers) need a worm bed, water, and food. The food can be your table scraps, decaying fruits and vegetable, horse, cow, pig, rabbit manure, newspapers and damp cardboard. The composting worms (red worms) can eat 1/2 to 2/3 of their weight in food per day. Digestion of the food will produce castings. Red worm castings are a natural fertilizer for your plants, they don’t burn roots. Gardeners LOVE the fertilizer benefits they get from the red worm castings, their plants grow bigger, faster, and improves crop yield. Red wiggler castings enriches the soil with micro-organisms, improves water retention and the physical structure of the soil. On average one pound of worms is about 1000 worms. Shipping: Orders are shipped Mondays only! with FedEx Express 2 day. Your package will arrive two days after the day shipped. Example, if shipped on Monday they should arrive on Wednesday. All Compost worms are drop shipped directly from the grower to ensure you get fresh lively worms. Guarantee: If their is a problem with your worms you must email or call within 24 hours of delivery to receive the live delivery guarantee. You can't leave your worms sit on your porch or at the post office for days, you must pick them up the day they arrive. From Norm Yeager of Taylors, South Carolina on 12/12/2018 . Delivery was prompt and worms arrived in good shape. This was my second purchase, will definitely buy again. From David Vaughan of Overland Park, Kansas on 11/7/2018 . Speedy, as stated. Arrived on time in good shape. Will use you guys again. From Marietta Pellicano of Citrus Heights, California on 10/17/2018 . I purchased these composting worms to put them in the center composting basket of two keyhole gardens we built this fall (2018). Time will tell if the conditions we created will be beneficial for them as well as for the success of the keyhole gardens. I can't wait for spring to see how they (the gardens)(& the worms) progress. I did plant an initial "winter" garden, and, so far, the plants are doing very well. I lined the very bottoms of the gardens with 1/4 inch hardware cloth since we have a vole population that loves to eat worms! I hope this will protect them in the gardens. So, thank you for the worms, they arrived safe/viable/&sound. I put them immediately in their new homes upon arrival. Time will tell now if my miniature "farming" hobby will produce some healthy veggies! From jerome hampton of Oviedo, Florida on 7/18/2018 . Seem to be good worms . Not as great as your Europeans in quality. But remain to be seen. Sent a lot of worms . Doing very good .Being shipped in FL where I am is a plus for raising. Need a little more time to make a better review . But each day they seem to be going good . From Anonymous of rowley, Iowa on 7/14/2018 . From bill lehman of bellefonte, Pennsylvania on 4/25/2018 . From jeff becker of rochester, Indiana on 4/18/2018 . arrived quickly and alive. thanks. From Joice Givens of Dallas, Oregon on 3/20/2018 . My worms arrived 3 days after shipment day.. ALL alive and doing well. From Anonymous of Suffolk, Virginia on 12/27/2017 . From Mike of Perham, Minnesota on 11/21/2017 . From Anonymous of Hastings on Hudson, New York on 11/7/2017 . From Anonymous of Streamwood , Illinois on 7/8/2017 . From Mike of Elyria, Ohio on 7/4/2017 . From Alan Welsh of Kensington, California on 7/4/2017 . No complaints. My worms were shipped almost immediately and I received them in perfect shape. These worms are thriving 1 week after arrival. From Anonymous of Fallbrook, California on 5/30/2017 . These worms made the trip nicely, looked good and wriggly upon arrival and seem to be thriving still 1 week later. From Jeffery Borden of pittsburgh, Pennsylvania on 5/25/2017 . From Anonymous of Lake View, New York on 5/23/2017 . The worms arrived quickly and were in good shape - a bit sleepy, but that's normal. I quickly added them to my compost pail and they have been happily turning my garbage into black gold! From Terry Trautloff of FULLERTON, California on 5/16/2017 . The worms got here in California in great shape. They are now working there majic in my garden! From scott crisler of Middletown, Indiana on 4/25/2017 . I have purchased 1000 worms a couple years ago from these folks and I truly love their speedy deliver and lively worms every time. What a great product. I will continue to tell all my friends. Thanks Speedy Worm!! From Lance Russell of Schuyler Falls, New York on 4/18/2017 . Ordered 1000 red worms on a monday and received them on wednesday, very fast shipping and the worms were very healthy and lively! Excellent service and i highly recommend Speedy worm! From Anonymous of Houston , Texas on 3/8/2017 . Worms arrived quickly and in great condition! Would have been a rockstar review if there had been a little guidance included as to how to care for and feed them upon arrival. One week later and they are alive and well! From Wendy Jones of Live Oak, Florida on 3/7/2017 . Worms arrived in excellent condition! From Dr. Carl J. Forster of Orwigsburg, Pennsylvania on 2/1/2017 . My order of 100 Euro Nightcrawlers arrived first, followed a few days later by 1000 Red Compost worms. Both shipments were in excellent condition. I thought $13 for shipping an $8 Euro NC order (0.21/each) was higher than local NC sales. But there was no shipping charge on the Compost worms, so I can live with that. I would ask you to check your email address as I sent a message asking for storage and feed advice but never got a reply. All said, I expect to reorder in the future. From Adilson Robert of LEES SUMMIT, Missouri on 1/25/2017 . Highly Recommended. My order arrived fast and in excellent condition. From Richard Simpson Simpson of Wildwood, Florida on 12/21/2016 . From Earl Wilson of rolla, Missouri on 11/22/2016 . From kevin taulbee of welling, Oklahoma on 11/16/2016 . From hele of Lafayette, California on 10/18/2016 . From Ashley of Janesville , Wisconsin on 7/26/2016 . I purchased as a fair project and they came right on time and they were all alive. From Nipigon Guy of Rogersville, Tennessee on 7/19/2016 . Worms arrived in pretty good shape considering July temps in the mid 90s here in East Tennessee. I would estimate about a 25% mortality but all due to heat. Our mail does not arrive until late afternoon so worms were hot all day. I would recommend ordering in cooler weather next time. Shipping was very prompt. From Anonymous of Gardner, Massachusetts on 6/18/2016 . many more and a healthy garden. From Anonymous of Akron, Ohio on 6/14/2016 . Prompt shipping. Arrived active and healthy. From Lori Ierace of Reva, Virginia on 6/8/2016 . Most beautiful, healthy worms! Five pounds of them. Packaged and shipped with care and love. Thank you! From Jeffery Borden of Pittsburgh, Pennsylvania on 5/2/2016 . Followed written instructions,worms turned out great.Would highly recommend this company too everyone. Jeff Borden Pittsburgh Pa.
From Kirk Hale of Taft, California on 4/20/2016 . Worms arrived healthy and are working away!! From Sheila Sartorius of Waterloo, Iowa on 3/29/2016 . Our worms arrived in great shape, even though the weather changed and it was much colder. I will be using this company again in the future for teaching others how to compost and setting up little shoebox bins to get students started. From Anonymous of Flagstaff, Arizona on 11/3/2015 . We were very pleased with the quality of the pound of worms we received for our composting project in the garage (late October 2015). More impressive was the timetable in which they were delivered. We ordered early on Monday morning and received on Tuesday - about 1700 miles away! From Tom of Neiwngton, Connecticut on 10/21/2015 . I love these worms as well as the Canadian Night crawlers. I use them for feeding my big tropical fish as well as late season trout fishing so it seems I can never get enough of them. The price was right, the quality was great and they arrived on time. I'll be ordering more in the future. From Rick of Lexington, North Carolina on 10/12/2015 . When I received my first two pounds of red worms I was concerned about the number count. I had taken into consideration the comments about the worms being dehydrated but still thought the numbers had to be off. I contacted Speedy Worms and they were wonderful to work with. About two weeks later I received a second shipment of worms (about one pound) unexpectedly. Could I have been wrong about the first shipment and count, sure I could have since I didn't count them. But now I have gobs and gobs of red worms so it worked out. I will go back to Speedy Worms for my next order which will be of Europeran Nightcrawlers. Thank you Speedy Worms for going the extra mile for your customers. From Lee of St Paul, Minnesota on 9/29/2015 . From Barb of Clarksville, Tennessee on 8/27/2015 . From Leonard of Myerstown, Pennsylvania on 8/25/2015 . The worms were definitely alive and very healthy! I noted the bag and the instructions that came with it. I will definitely continue to order from your company and will highly recommend you to our friends and neighbors. From Paul of LaFollette, Tennessee on 8/5/2015 . Received shipment, followed the simple instructions. Worms are happily chewing away! Everything was perfect. From Anonymous of Genoa, Illinois on 7/14/2015 . Good job, the worms are happy in their new home. From Robert Pike of Cheyenne, Wyoming on 7/8/2015 . Ordered the worms to use in our garden and flower beds. Worms arrived alive and squirming and have since gone to work doing their jobs. Would and might order again. From Dan of Spokane, Washington on 7/1/2015 . Came in three days. half a cup of water and they were a squirming nightmare in about 10 minutes. They are now busy turning a tub of half composted yard waste and a few pounds of kitchen waste into rich fertilizer. I would definitely recommend this supplier to anyone. From moss goriesky of marshfield, Wisconsin on 6/9/2015 . great as promised thanks !! From Snowy Pine Ranch of Graeagle, California on 6/5/2015 . I ordered 10 pounds of Red Composting Worms and they arrived in 4 days in PERFECT condition. They are active and went right to work! Very pleased with Speedy Worms. Thank you. From Anonymous of HAMILTON, Michigan on 5/28/2015 . WORMS ARRIVED AS PLAN AND ALL LOOK GREAT! From Anonymous of Victoria, Minnesota on 5/12/2015 . Wow that is a lot of worms! Ordered 2000 - enough for a busy family that eats lots of veggies and will be happy to see the worms busy outside and then inside through the winter. Simple clear directions. Thanks! From Daniel Cowart of Ft Mill, South Carolina on 5/12/2015 . All happy customers!!!!!! No complaints. They all call to ask questions in how to take care of them, but not one word of complaint about the worms and that is huge!!!!!! From Anonymous of fryeburg, Maine on 5/5/2015 . From Anna Weidemann of St. Paul, Mississippi on 5/5/2015 . All worms arrived alive and well. Three days after being introduced to their new home, they are finishing up their first meal of slimy rhubarb (didn't get around to making that pie!). Thanks for the little wigglers. From Anonymous of La Mesa, California on 4/29/2015 . The worms arrived in a few days without any problems. From Kevin Coffaro of san jose, California on 11/25/2014 . all worms are alive and well! From David of Carrollton, Georgia on 11/18/2014 . From Norm of Donner, Louisiana on 10/14/2014 . From gerald mccaffery of ridgeland, Mississippi on 8/27/2014 . The worms dove right into their bed. I really liked the bag. From J. Pietras of Hamburg, New York on 8/6/2014 . That which was offered, was delivered. The instruction sheet that was included in the shipment was very helpful in what to expect and what to do with the worms. The delivery time was right on. The order process was easy. The price is competitive. There were only a few worms that didn't make it and only a few more that have died since. But, these are only some out of two pounds of worms (which is, as I understand, approximately 2,000 worms). Again, well done, Speedy Worms. From Dave Kass of Walcott, Iowa on 7/16/2014 . The order arrived in surprisingly great shape. From Anonymous of louisville, Kentucky on 6/26/2014 . From TOM ROCZEN of Nederland, Colorado on 6/17/2014 . From Roger Tripp of Fredericktown, Missouri on 5/22/2014 . Id order these early each year to raise the ones i need for a following year of worms. From Anonymous of WILMETTE, Illinois on 5/20/2014 . SPEEDY WORMS IS WITHOUT DOUBT THE ONLY TRUE WORM VENDOR, PERIOD. I HAVE SADLY BOUGHT FROM OTHER WORM FARMERS BEFORE AND DAMN IT, WHEN YOU ADVERTISE 1000 OR 2000 WORM DEALS, THAT IS WHAT YOU SHOULD GET !!!!!!!!!! NOT 100 REGULAR SIZE AND MAYBE COUNTING THE EGG PODS AS 5-7 EACH. SPEEDY WORMS DELIVERS BIG HEALTHY WORMS AND PLENTY OF THEM. (NO I DON'T COUNT THEM) BUT I AM VERY VERY SATISFIED !!! THANKS WORM DUDE. From Markhiggy of Virginia Beach, Virginia on 4/29/2014 . Thanks for the Speedy worms...you live up to your name. Great communication too. From Hannah Grundyson of Lake Park, Minnesota on 4/23/2014 . My worms arrived right alive and are now happily living in my composting bin! Will be ordering from here again if ever the need arises. From L. O. Johnson of Elk River, Minnesota on 4/8/2014 . Came on time as promised. Put them on the top of my composter and turned the lights on. Any dead ones would lay on top. No dead ones after 20 minutes. excellent. Communications were excellent: emails for acceptance of order, followu-ups to show progress and ship dates. Couldn't be happier with this company. Result: I'd do it again. From Dale Bucholz of Jim Falls, Wisconsin on 4/2/2014 . I Received my worms alive and healthy and two weeks later there still doing fine. YES I would recommend I've bought from others but none were this big and lively. From Randy of Winona, Minnesota on 3/22/2014 . From Anonymous of Cumberland, Maryland on 1/29/2014 . Very happy with the composting worms. From John Williams of Lucedale, Mississippi on 1/29/2014 . From Mikelle Malone of Eau Claire, Wisconsin on 7/17/2013 . With the high temperatures, I was unsure what condition the worms would arrive in. They arrived in great condition--alive and squirming. I would definitely order from Speedy Worms again. From Jim of Brooklyn Park, Minnesota on 6/24/2013 . The worms arrived in a week and are doing great! I ordered one pound and it seems like there were lots of them! From Candy Byrd of Merrifield, Minnesota on 5/22/2013 . I purchased a Worm Factory 360. I then went to the site Find Worms as recommended. Speedy Worm was in my state and I placed my order for 1000 composting worms. They arrived during optimum weather as their site stated they would only be shipped and my order status was update as needed for my review. The worms arrived health and after nearly a month are doing a great job! After reviewing buying from Amazon, Speedy Worms is the place to go for a great product. From Dana Phillips of Isanti, Minnesota on 2/13/2013 . The worms I ordered arrived and seem happy and healthy. They began eating compost quickly. I am very happy with Speedy Worms and will use them again in the future. From Rev. Gardner of Melbourne, Arkansas on 1/4/2013 .